canoemodelkitsOur BlogUncategorizedAfter much work, have the new CNC router in place and running. Lot of work! My trusty homebuilt CNC has been great and still works very well, but there were limitations. I had thought of building a new one, but the parts alone would cost a couple thousand. I had been looking around for a long time for a used one, but choices were very limited and or far away. I found this Chinese made CNC which is one of the Ebay CNC’s that you can get from China. Very heavy and quite well built. Doesn’t appear to have been to much. Had to do some work on it. It used the same software Mach 3 which i was familiar with, and the components are all available right on Ebay. it is 4 times larger than the one i built. 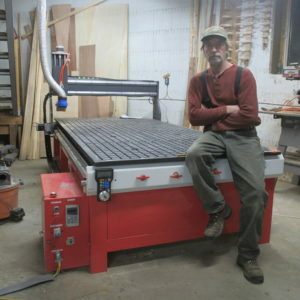 it is capable of cutting a 4′ x 8′ sheet rather than the 24″ x 43″ of my home built. I am very pleased with it and got it for an okay price. All of my parts should be a little cleaner edges and cuts. I will post more on the DIY CNC page.